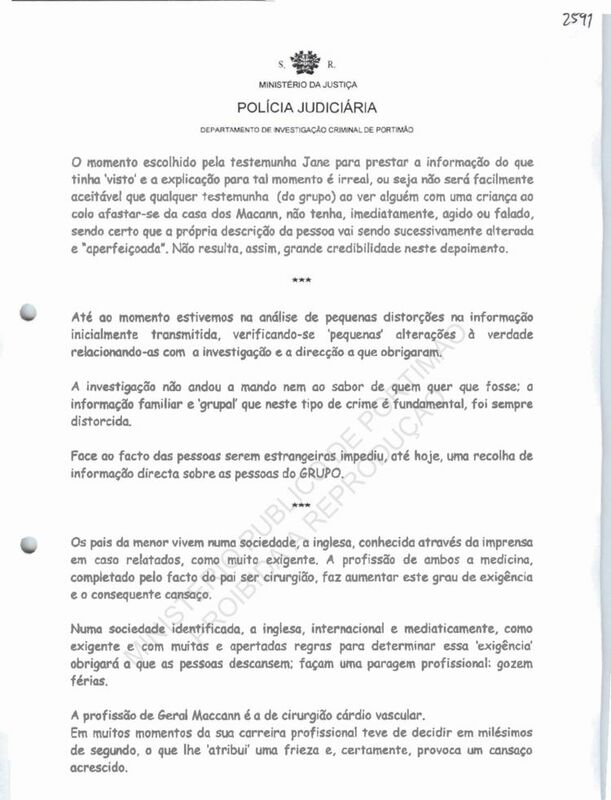 Where he concludes, after analyzing all the evidence gathered, that the child is dead and the parents were responsible for cadaver occultation, and the entire GROUP was lying since the first day of the investigation. MADELEINE BETH MCCANN was born on the 12th of May of 2003. 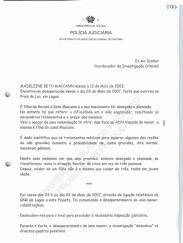 She is missing (disappeared) since 03 of May of 2007, a fact that occurred in Praia da Luz, Lagos. She is the daughter of Gerald and Kate McCann and her birth was desired and planned. However it must be referred the difficulty of the mother to get pregnant, from which resulted the necessary treatments and their 'costs'. [I presume he refers more to the emotional and social costs than monetary ones]. She was born after fertilization 'in vitro', but in face of the DNA profile of the minor, she is the daughter of the couple McCann. It is a scientific fact that the medical treatments to overcome some of the causes for a non-pregnancy raises the probability of, in a normal pregnancy, twins may be born. In this case we can see that a pregnancy, although desired and planned, turned into a family situation of five instead of three persons. And then, to take care of one child is not the same as taking care of three, all very young. 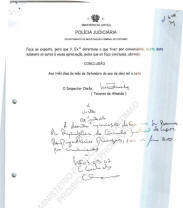 At around 24h on the 3rd of May of 2007, through a phone connection from the Lagos GNR to this 'piquet', was communicated the disappearance of a minor, a British subject. 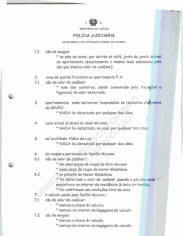 We went to the local to proceed to the necessary judiciary inspection. 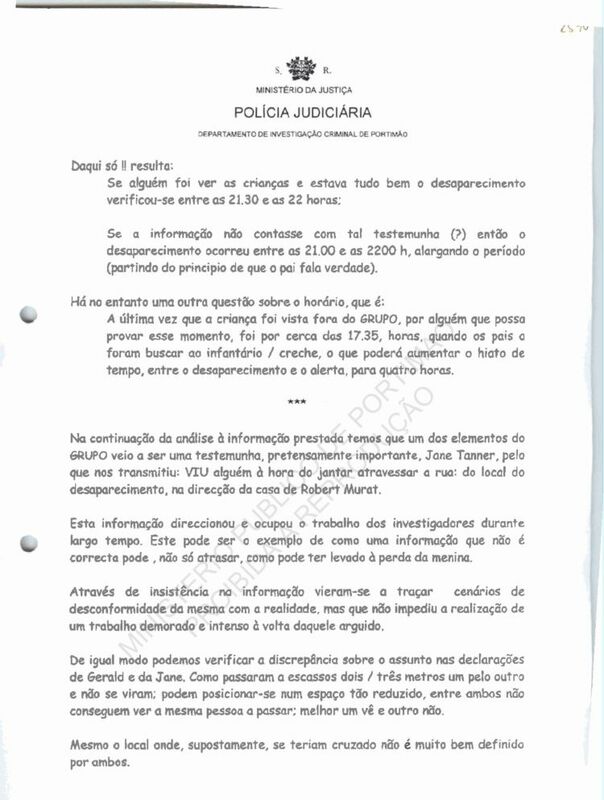 Before the fact of the disappearance of the minor, the investigation 'designed' the several possible sketches. 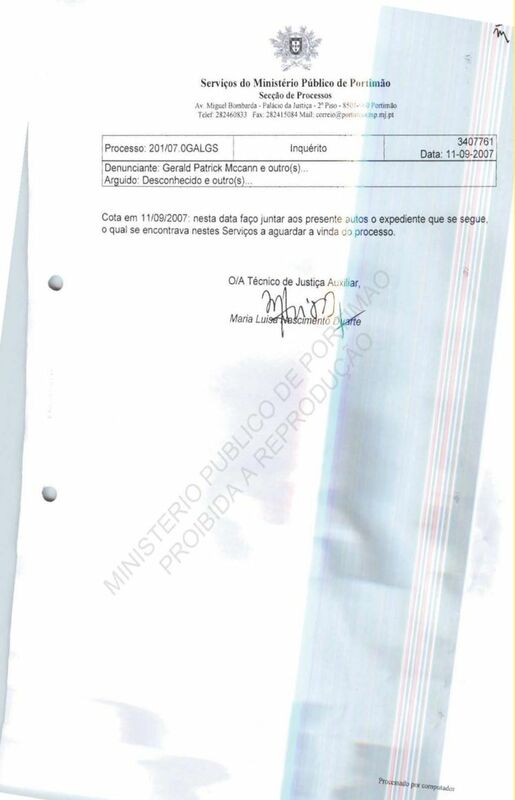 From the beginning the parents of the minor attributed the fact (disappearance) to the action of a third party, defending the KIDNAPPING. Even though it was a possible scenario, the actions of the family were in the sense of conducting into that direction, through the publicity of the fact in a way that was never seen before. In fact, in the following day, the British televisions 'opened' the news already publicizing the disappearance/kidnapping of the minor. The defence of this scenario was, for the Media, the truth of the facts under investigation. Time went by without the confirmation of this scenario by the presence of any of its necessary assumptions. It was never requested any sort of ransom in exchange for information or the child herself. However and in front of the depositions of one of the friends, Jane Tanner, one could presume to be before such frame. Meanwhile the diligences continued in order to recover all types of information and always in the perspective of working over all the possible scenarios. The information recovered, in the beginning, with the family and friends, was uncertain and 'worked up', by the group, in order to give strength to the version presented and defended. According to the parents and the GROUP, they went for dinner and all of them left the children, sleeping, in their respective apartments. The elements of the group had a meeting where they agreed on certain rules that sustained the version that they accompanied continuously the children, while they dined. 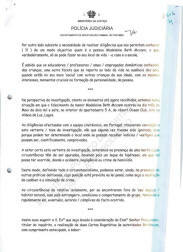 It is annexed a manuscript of an element of the group that gives consistence to this thesis. 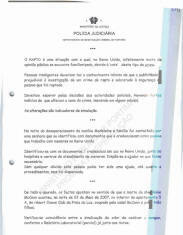 These principles that, in this way, were shared by all the group makes that all the GROUP is always exculpated in the eyes of the British public opinion, making it impossible that any abnormal occurrence that occurred could take more than 30 minutes, once they all agreed to be that the timing they used to look for the children. The version that someone in the group that every 15 minutes or every 30 minutes went to the apartments to check if everything was alright falls down! 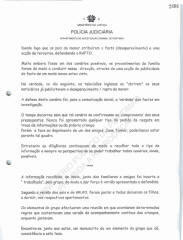 From the declarations of the group results a total incoherence, in the face of which it's obvious, that everyone lies. We may verify that one of the elements of the group wanting to provide consistency to the group's version, gives it a personal touch: the checking on the children were done in two ways, one just by listening if anyone was crying and in case there was silence than everything was well and the other one, by really checking. On his turn to verify the children, one of the elements of the group, Mathew, acted on this manner, and he even told Kate that everything was okay but without specifying. Kate remembers this detail. The truth, however, is that this statements made the investigation to wander, losing time and resources. It is not admissible (understandable) that this information was given in the beginning and maintained all along the time, in spite of the fact that anyone could verify the losses that it caused to the investigation. 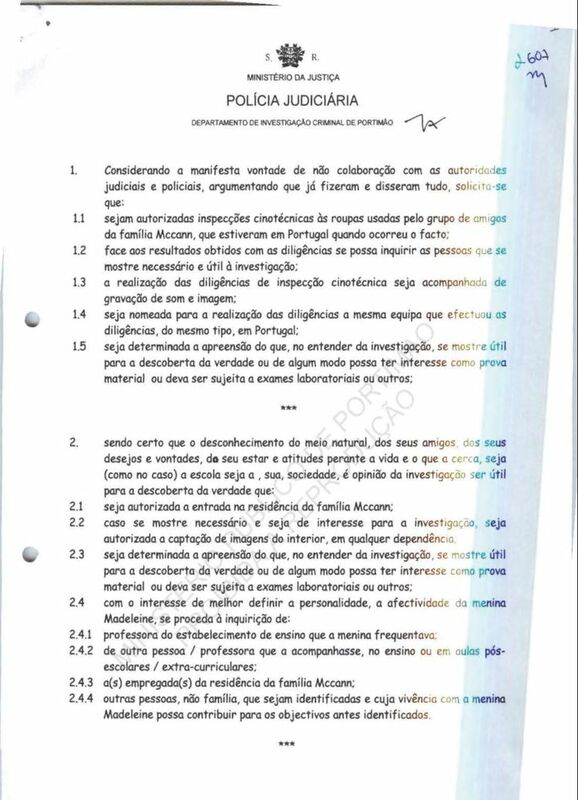 After all this time the version is maintained paired with the public and 'hammered 'statement that what they want the most is 'to help the investigation'. The investigation had to assume the incorrect information and move forward.
' 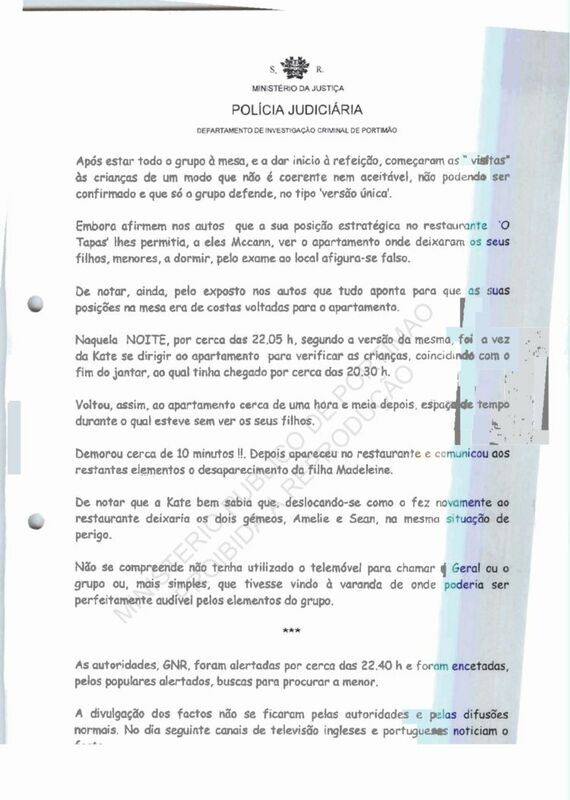 The last time the child was seen outside of the GROUP, by someone that can prove that moment, it was around 17h:35m, when the parents went to fetch her from the Creche, which can enlarge the gap of time, between the disappearance and the alarm, to four hours. Continuing with the analysis of the information presented, we have an element of the GROUP that became a witness, pretensely important, Jane Tanner, because of what she communicated: she SAW someone at dinner time crossing the road from the place of the disappearance, in the direction of Robert Murat's house. 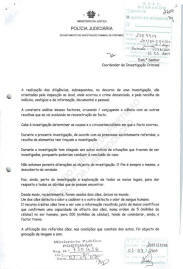 This information swerved (directed) and mobilized the work of the investigators for a long time. This can be the example how information that is not correct can, not only delay, but could have also lead to the loss of the little girl. Through the insistence on the information, several scenarios of the disconformities of that with the reality were traced, but it didn't prevent the realization of an intense and long work around that arguido. 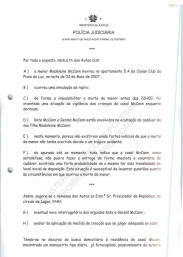 We can also verify the discrepancies about the subject on the declarations of Gerald and Jane. How to pass at scarce 2 / 3 meters from each other without seeing one another, they can be positioned in such a reduced space, and between them they cannot see the same person passing by; or rather, one sees but not the other. Even the local where, assumingly, they crossed each other is not well defined by any of them. 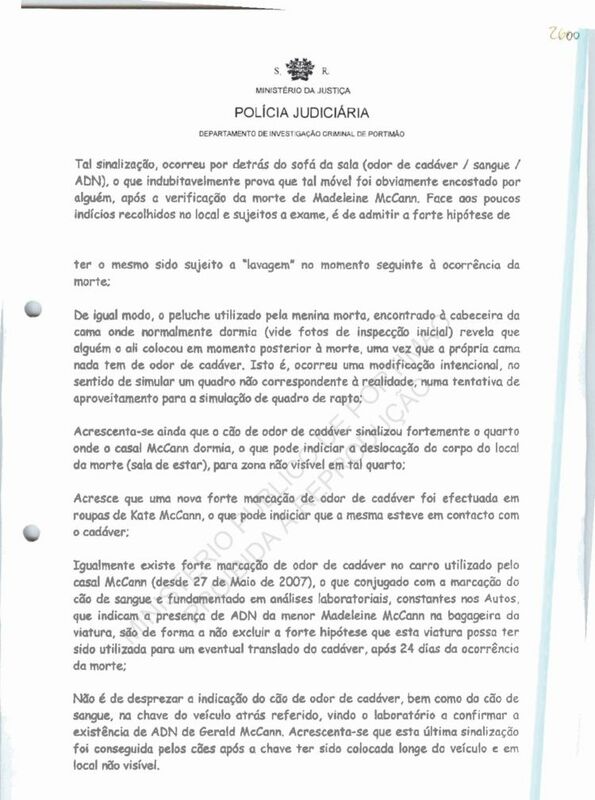 The moment chosen by the witness Jane to make her statement about what she had 'seen' and the explanation for that moment is unreal, that is, it is not easy to accept that any witness (from the group) when seeing someone with a child in the arms getting away from the McCann's place, hadn't immediately acted or spoken, being certain that the description of the person was being consecutively altered, 'perfected'. So, there isn't much credibility on this deposition. Until now we have been analyzing small distortions in the information initially transmitted, being noticeable 'small' alterations (distortions) of the truth, and relating it with the investigation and with the directions it forced it into. The investigation didn't follow the command or the will of anyone; the family and Group's information that on this type of crime is fundamental, was always distorted. 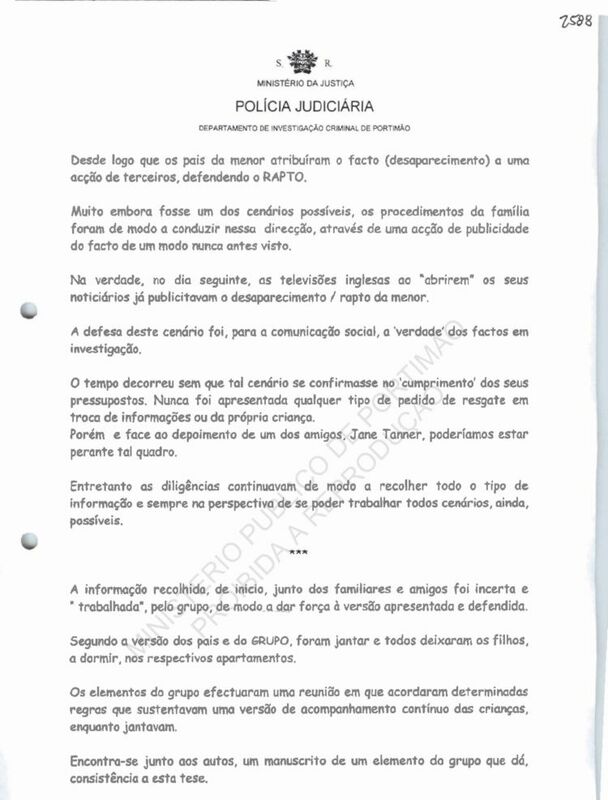 The fact that the individuals were foreigners prevented, until now, that direct information about the persons of the GROUP were obtained. 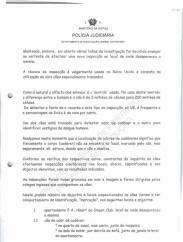 The parents of the minor live in a society, the British, known through the press, as very demanding. The professions of both parents, medicine, completed by the fact that the father is a surgeon, increases this degree of pressure and consequent tiredness. In a society identified internationally and in the Media as very demanding and with many and tight rules to establish those standards of exigency, it makes it obligatory that people rest; make a professional retreat; take their holidays. Gerald McCann's profession is a cardiovascular surgeon. On many moments of his professional career he had to make decisions in thousandths of a second, which gives him certain 'coldness' and, certainly provokes an increased tiredness. The enjoyment of a period of holidays supposes a rest through non-ordinary practices and freedom and exemption from schedules. The social life in such a holiday, in the present case, was facilitated by the fact that they travelled as a group. But that social life may, in a certain way, be touched by the presence and constant needs of accompanying the minors. This evidence and need was clear in the deliverance of the children by the respective children's centres and creches (according to their ages). The holiday time was not shared between parents and children. The day, 03 of May of 2007, had gone by, until dinner time, in a natural way according to the adopted style. After getting the children from the Children's centres and the creche they went to the apartment, little after 17:35h. But' Kate went running for half an hour at the beach and then went to the apartment and' Gerald went to play tennis. While the tennis play was taking place another element of the group that had been in touch with Kate, in the apartment, in a period of time that could have taken between 30 seconds, according to Kate, and 30 minutes, according to Gerald. In thirty seconds we may ask if everything is well and if anything is needed, little more. They put the minors to bed and to sleep, around 19:30h. They stood at home until 20:30h, going to the Tapas restaurant afterwards. Of the group they were the first to arrive. Although the entire group was at the table and starting the meal, they began the 'visits' to the children in a way that is neither coherent nor acceptable; that could not be confirmed and only the group defends it, in a sort of 'unique version'. 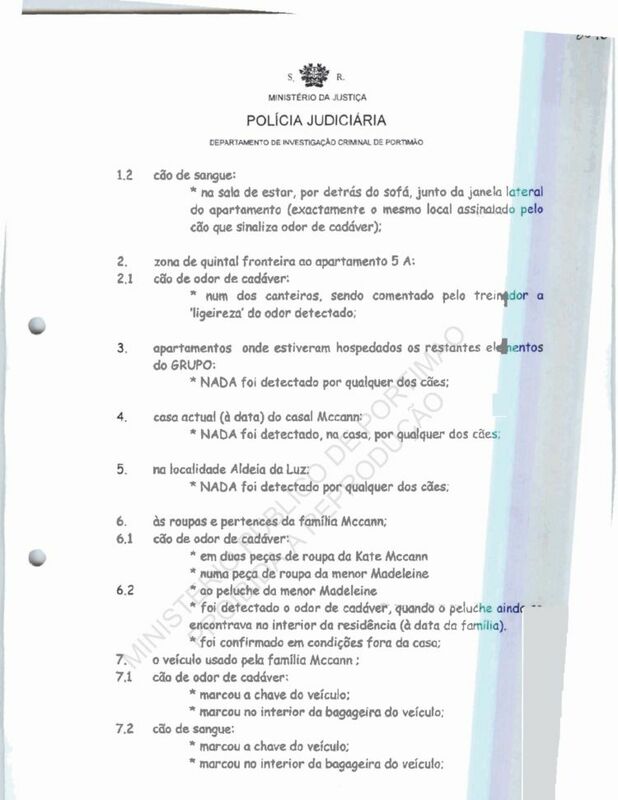 Although they say in the 'Autos' that their strategic position in the Tapas restaurant allowed them, the McCann, to see the apartment where they'd left their children, minor, sleeping, the exam of the local reveals it is false. It must be noted, also, that by the stated in the 'Autos' everything points to their position at the table with their back to the apartment. 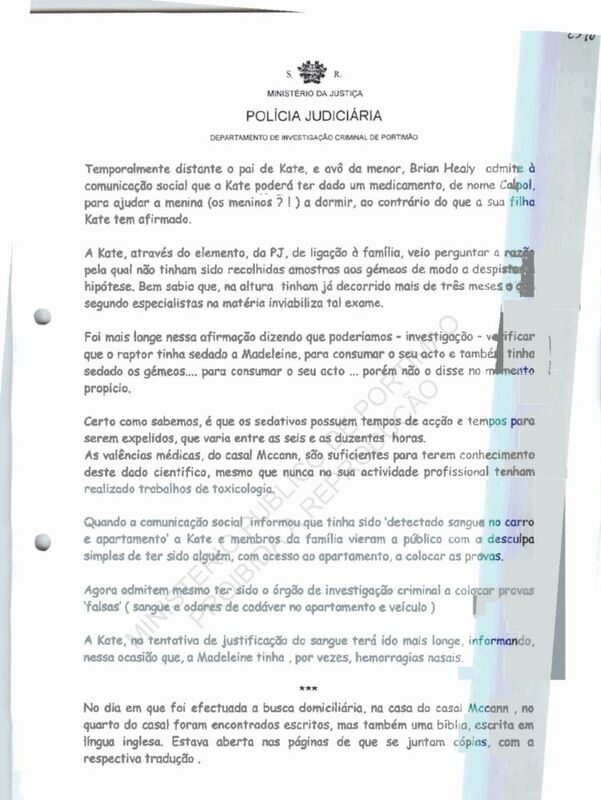 On that NIGHT, around 22:05h, according to her version, it was Kate that went to the apartment to check the children, coinciding with the end of the dinner, at which she had arrived at 20:30h. So, she returned to the apartment about one and a half hours later, the time lapse while she didn't see her children. It took her about 10 minutes. She returned to the restaurant and communicated to the remaining elements the disappearance of her daughter Madeleine. It must be noted that Kate knew that, going back to the restaurant as she did, she would leave the twins, Amelie and Sean, in the same dangerous situation. It is not understandable why she didn't use the cell phone to call Gerald or the group or, even simpler, that she didn't go to the balcony from where she could be perfectly heard by the elements of the group. 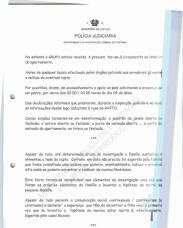 The authorities, the GNR, were alerted around 22:40h and, he population alerted, started the searches for the minor. The divulgation of the facts weren't kept within the authorities and the normal channels. On the following day the British and Portuguese TVs were advertising the fact. The GROUP was together. The search was circumscribed to the interior of the apartment. 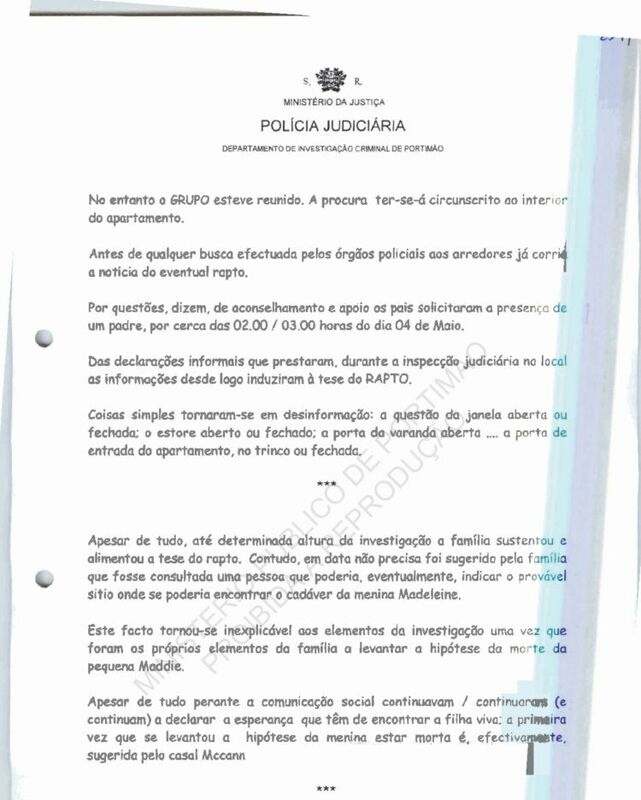 Before any search by the authorities at the surroundings the notice about an eventual kidnapping was already running along. 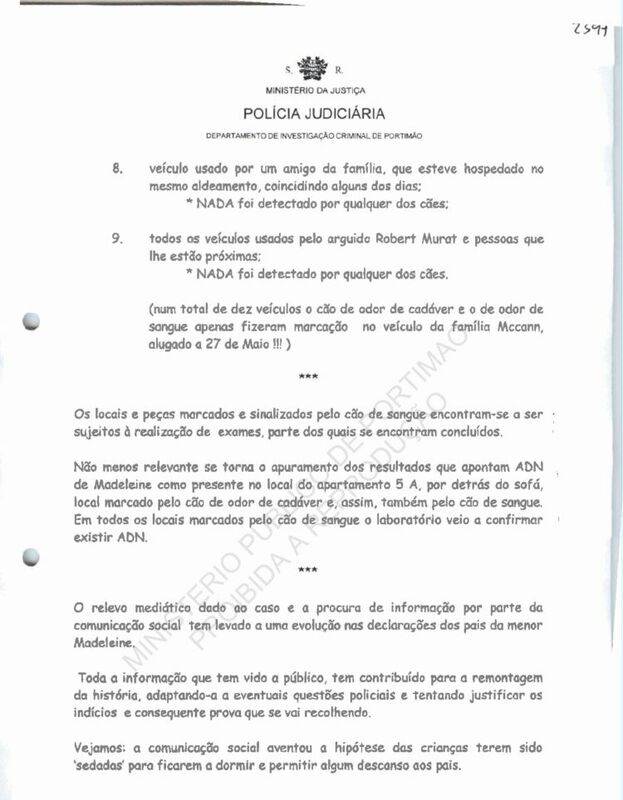 By reasons, they said, of counselling and support the parents asked for the presence of a priest, at around 02:00h/03:00h on the 04 of May. 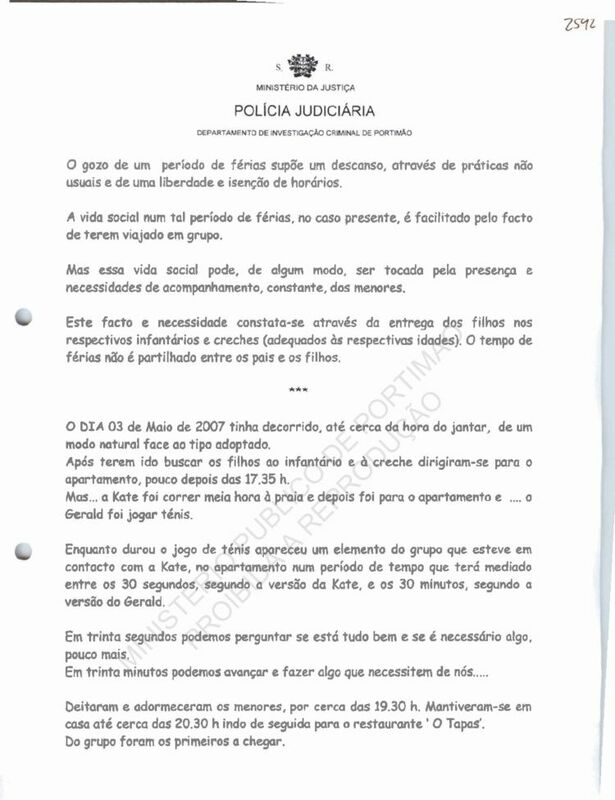 On the informal depositions they made, during the judiciary inspection made at the local, the information immediately induced the thesis of KIDNAPPING. Simple things became disinformation: the question of the opened or closed window; the shutter up or down; the balcony door opened' the front door, locked or open. Despite everything, until a certain time in the investigation the family sustained the thesis of kidnapping. However, in a date that cannot be precise it was suggested to the family that they should consult a person that could, eventually, indicate the probable place where the cadaver of little Madeleine could be found. This fact became inexplicable to the elements of the investigation once it were the members of the family that raised the hypothesis of death of little Maddie. Nevertheless, before the Media they kept (and keep) declaring their hope on finding their daughter alive: the first time that the hypothesis of the death of the little girl was raised it was, effectively, suggested by the McCann. 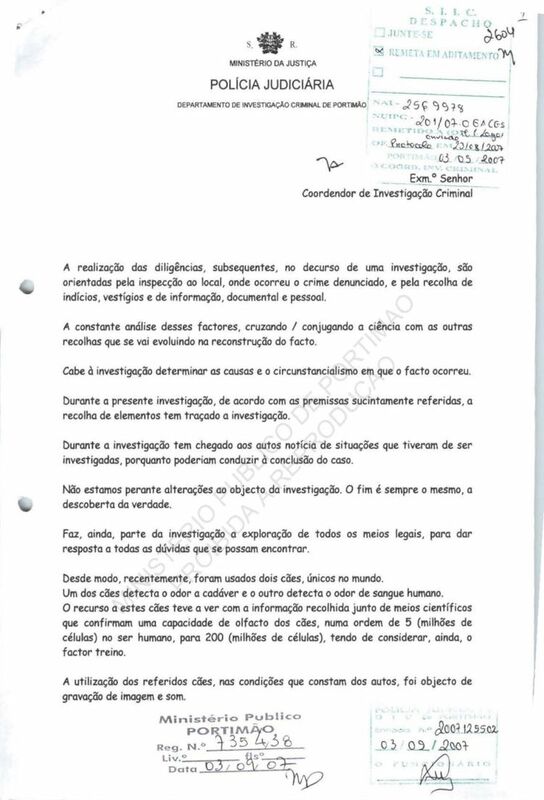 Although maintaining all the lines of the investigation opened it was, nevertheless, decided to advance in the direction of a new inspection to the local where the girl disappeared. The inspection technique is frequently used in the United Kingdom and consists on the use of dogs especially trained. As it's natural it is the dog's olfact the 'sense' used. In the case of this 'sense' the difference between the human and the dog is 5 million cells to 200 millions. It must be highlighted that the resource to this kind of inspection is frequent in the UK and the success rate is 100%. One of the dogs is trained to detect the odour of cadaver and the other to identify vestiges of human blood. We refer now that the location of the cadaver odours signifies that physically the body (cadaver) is not on the place, marked by the dog, but certainly it has been there, as long as the dog signals it. As it can be verified from the 'Autos', in the inquiry, the dogs inspected the locales and objects with the results described below. All the inspections were recorded in sound and image and were directed by our British colleagues that accompanied the dogs. The places and the pieces marked and signaled by the blood dog are being subjected to forensic exams, part of which are already concluded. Not less relevant is the refinement of the results that point towards Madeleine's DNA as being present at the apartment 5A behind the sofa, a place marked by the cadaver and the blood dog. In every place marked by the blood dog it was confirmed there was DNA. 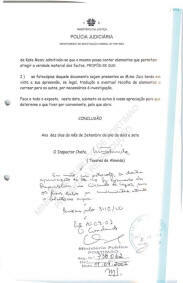 The Media enhancement given to the case and their search for information has contributed to an evolution on Madeleine's parents declarations. 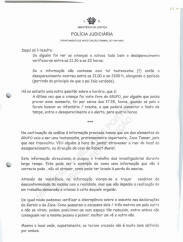 All the information that was made public, contributed for the remixing of the story, adapting it to eventual police questions, and to attempts to justify the indicia and consequent proof that was being collected. Let's see: the media forwarded the hypothesis that the children could have been sedated to be kept asleep and allow some rest to the parents. Distant in time Kate's father, the grandfather of the minor, Brian Healy, admits to the press that Kate could have administered some medication to the little girl, Calpol, to help the child (children'') to sleep, contrary to what his daughter Kate had stated. 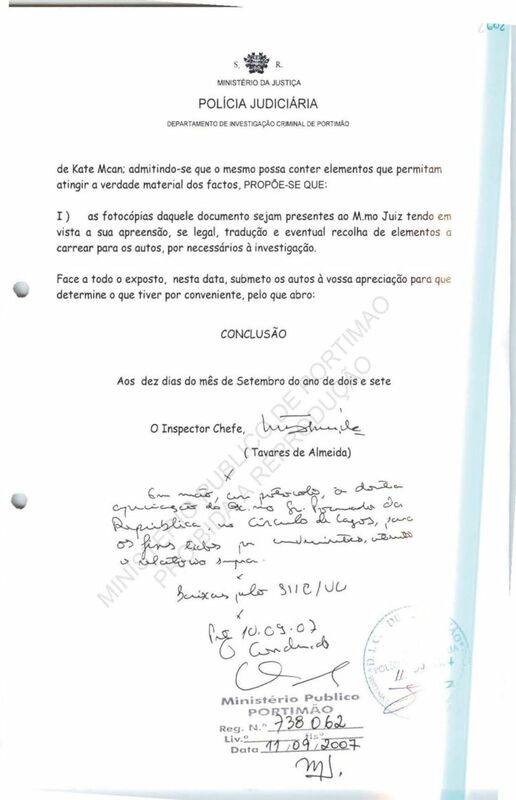 Kate, through the PJ inspector that acted as 'liaison' with the family [NOTE: that is Ricardo Paiva], asked why samples weren't taken from the twins in order to test that hypothesis. She knew well enough at that time, more than 3 months later, that such exam would be inviable. She went further and said that we ' the investigation ' should verify that the kidnapper had sedated Madeleine, to accomplish the action and he had also sedated the twins 'to consummate the act' however she didn't say that at the right moment. And we know that the sedatives have timings to act and timings to be expelled, that varies between six and 200 hours. 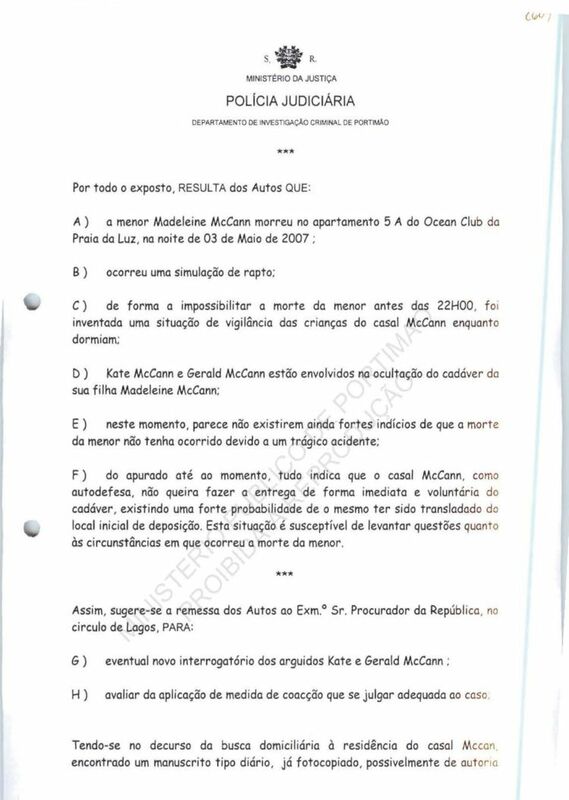 The medical knowledge of the McCann is enough to know such, even if their professional activity never passed by performing toxicology exams. When the media informed that blood had been detected 'in the car and in the apartment', Kate and members of her family come to the public with the simple excuse that it had been someone, with access to the apartment, to place the evidence. Now they even admit it was a member of the criminal investigation to place the 'false' evidence (blood and cadaver odour in the apartment and in the car). Kate in an attempt to justify the blood went even further, informing that on that occasion, Madeleine had, sometimes, nasal haemorrhages. 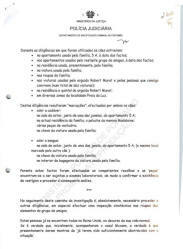 On the day that a house search was performed, in the residence of the McCann, on the master bedroom, written papers were found as well as a bible, written in English. 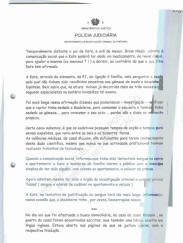 It was opened on the pages whose copies are annexed here, with the translation. KIDNAPPING is a situation with which, unfortunately, in the United Kingdom, most of the public opinion is used to, due to the rate of this kind of crime. Intelligent people should have a minimum of knowledge that the publicity is harming to the investigation of a kidnapping crime and especially to the safety of the kidnapped person. They should have waited for the decisions from the police authorities, there is strong evidence that the crime scene was altered, some furniture was moved around. Those changes are indications of simulation. 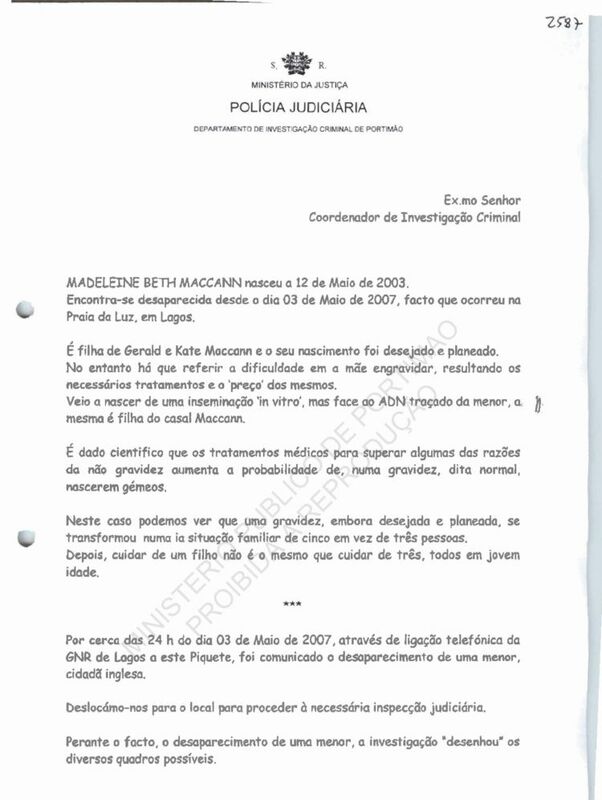 On the night of the disappearance of the little girl Madeleine the family was contacted by a lady that identified herself with documents that credited her as somebody that worked with minors in the United Kingdom. 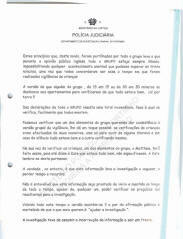 She identified herself with documents/certifications used in the UK, into hospitals and centres for the care of minors. She offered her help in whatever was needed. No doubt this person could have been of valuable help, even about procedures, but she was dismissed. There is a coincidence between the marking of cadaver odour and blood, according to the Laboratory Report (partial) annexed to the 'Autos'. Such markings, occurred behind the sofa of the living room (cadaver and blood odour/DNA), which proves that indubitably such piece of furniture was pushed back by someone, after the death of Madeleine McCann occurred. Because of the weak (small) vestiges recovered at such place, it is to admit as a strong hypothesis that the same was subjected to a wash, at the time the death occurred. It can't also be neglected the indication of the cadaver and blood dog, on the car key, having the laboratory confirmed the existence of Gerald McCann's DNA. This last signalling was obtained by the dogs after the key was put far away from the car and in a place not visible. 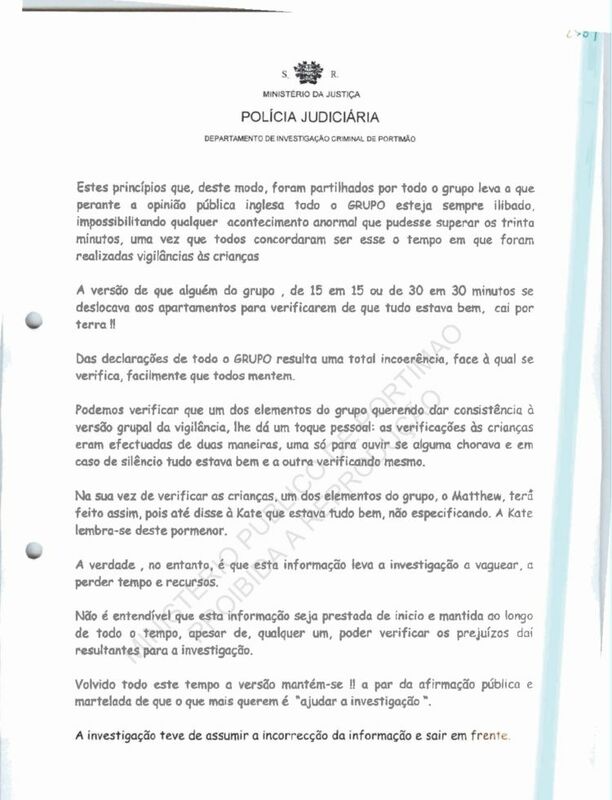 The police work in the course of an investigation is oriented to the inspection of the place where the crime occurred, and to the recovery of clues, trace evidence and information - documentary and spoken [obtained from people]. The constant analysis of those factors, crossing/joining science with the other things collected that evolve into the reconstruction of the event. It falls to the investigation to determine the causes and circumstances in/under which the event occurred. 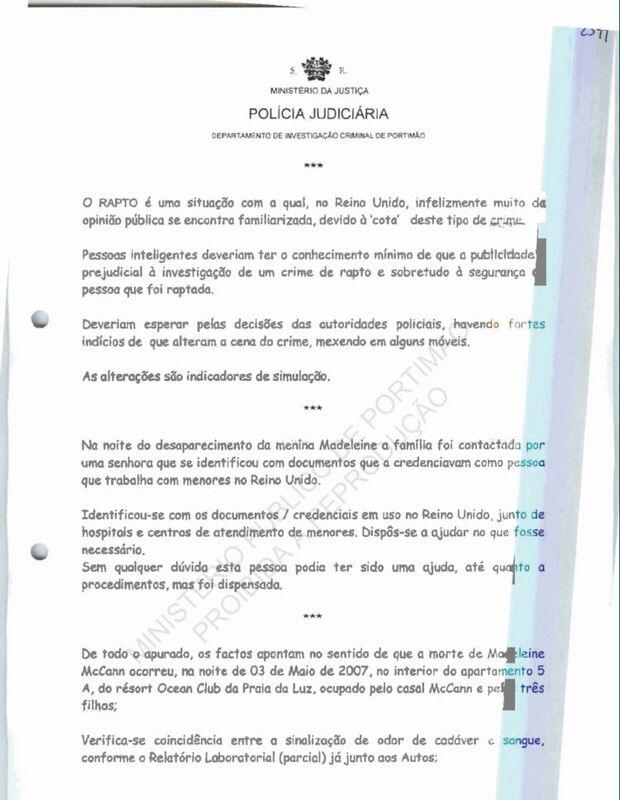 During the present investigation, in accordance with the premise(s) succinctly enumerated, the recovery of items has delineated the investigation. 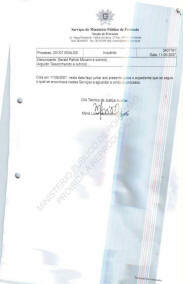 During the investigation the official case file papers included notice of situations that had been investigated, considering that they could have driven the case to a conclusion. We are not faced with changes to the objective of the investigation. The end [aim] is always the same, the discovery of the truth. There remains, still, part of the investigation that explores all the legalities, to answer all the doubts that can be found. In this way, recently, two dogs, unique in the world, were used. One of the dogs detects the odour of a cadaver and the other detects the odour of human blood. Recourse to [In using] these dogs one had to consider the information gathered by scientific means [methods] which confirm the olfactory capacity of dogs being 200 million detector cells, compared with 5 million in humans, also having to consider the training factor. 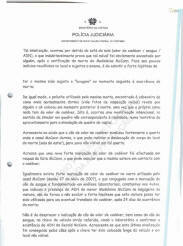 - in diverse areas in and around Praia da Luz. * inside the boot area of the car used by the family. Before [in front of/faced with] these facts authorised collections were undertaken and the 'pieces' were subjected to laboratory examination, in a manner to confirm the existence of trace evidence and to proceed with its consequent analysis. In following this investigation path it is, absolutely, necessary to proceed with other work, especially to perform a canine inspection of the clothing of members of the group of friends. Already all of these people are [back] in the UK, carrying on their normal life. 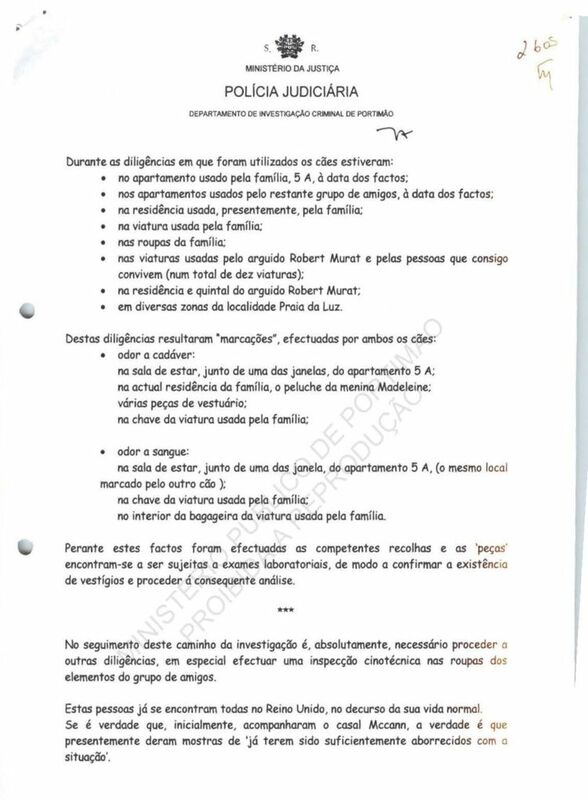 If it is true that, initially, they accompanied the McCann couple, the truth is that presently they show signs of "already they have been [become] sufficiently weary [tired/bored/annoyed] with the situation". On the other side [hand] there is the necessity to perform work that allows us to know [find out] (!!!) 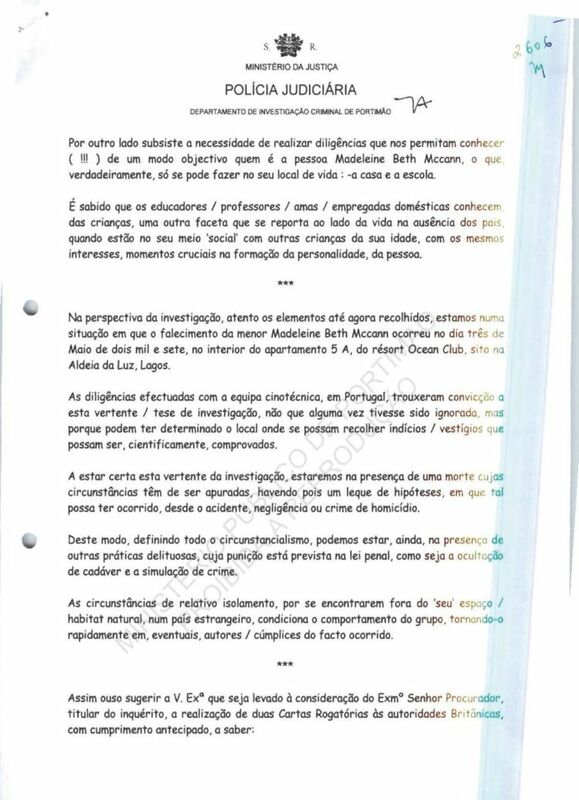 objectively [in an objective way/manner] who is the person Madeleine Beth McCann, which, truthfully, can only be done in the place she lives: - the home and the school. It is known that the educators / teachers / nannies / domestic employees know the children, another facet [feature/angle] that refers [ alludes] to the side of life in the absence of the parents, when they [the children] are in their 'social' circle with other children of their own age, with the same interests, crucial moments in the formation of the personality, of the person. 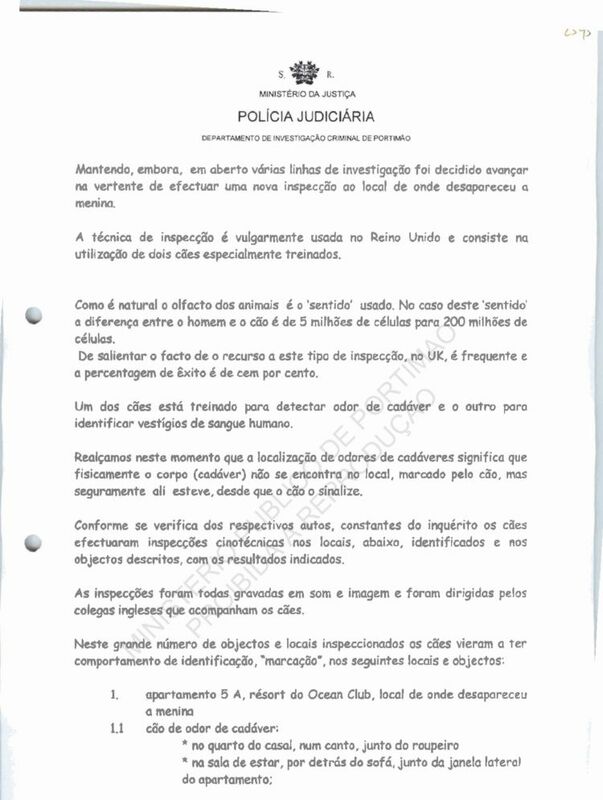 From the perspective of the investigation, heedful of the items gathered up to now, we are in a situation in which the death of Madeleine Beth McCann occurred on 3 May 2007, inside apartment 5A of the Ocean Club resort in the town of Luz, Lagos. 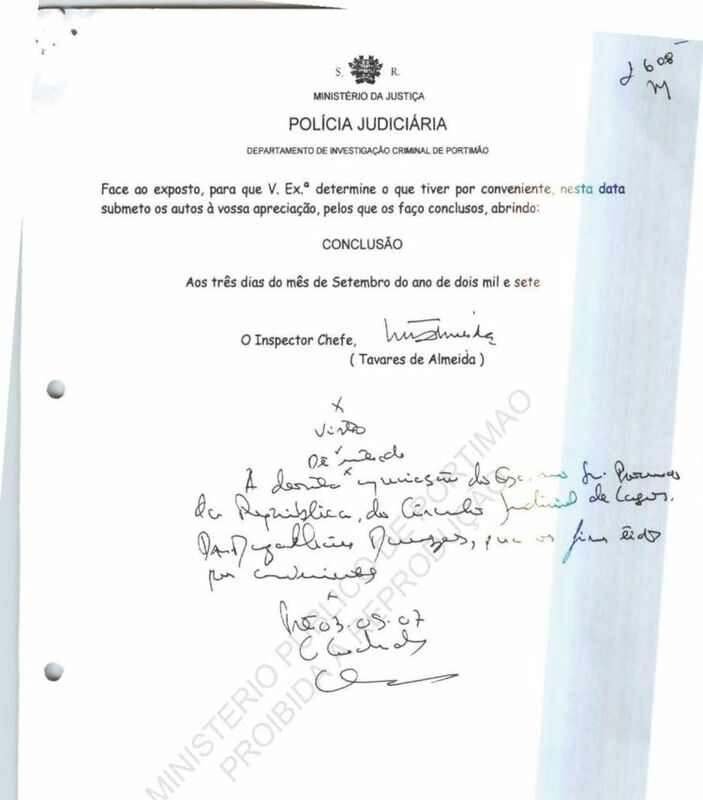 The work done by the dog team, in Portugal, brought conviction of this slope [ angle] / proposition [ theory] of the investigation, not that it had been ignored previously, but because they [the dogs] could have determined the place where clues / trace evidence could be recovered that could be, scientifically, proven. To be certain of/in this angle of the investigation, we had to be in the presence of a death whose circumstances had to be determined, there having been a fan [spread, range] of hypotheses [possibilities] in which such [death] may have occurred, through accident, negligence or crime of homicide. In this way, defining all the circumstantial-ism [taking into account all the circumstances and all the circumstantial evidence], we may be, still [ yet], in the presence of other delictual practices, whose punishment is foreseen [prescribed] in the penal law, such as the hiding [concealment] of a body and the simulation of crime. The circumstances of relative isolation, they having found themselves outside [away from] 'their' space / natural habitat, in a foreign country, conditions the behaviour of the group, rapidly turning it [the group] into, possible, perpetrators of / accomplices in the event that occurred. 1.5 it be determined [ permitted] the seizure of anything that, in the understanding of the investigation, shows itself to be useful for the discovery of the truth or is in any way of interest as material proof [evidence] or should be subjected to laboratory, or other, examination. 2.4.4 other persons, non-family, who may be identified and whose association [experience] with the girl Madeleine may contribute to the above objectives.